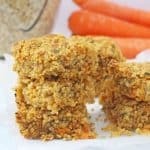 A simple savoury flapjack recipe made with carrots, cheese, nuts and seeds! Preheat the oven to 170c. Grease or line a 25x20cm tin. Put the oats into a large mixing bowl. Wash and top and tail and peel the carrots and then grate them into the mixing bowl. Grate the cheese and add this to the bowl. Add the seeds, nuts and herbs and mix well. Melt the butter in a saucepan over a low heat but be careful to not let it burn. Pour the melted butter into the bowl over the other ingredients and stir well until everything is well combined. Spoon the mixture into the tin and press down with a spoon. Bake in the oven for 25 minutes until golden. Whilst the flapjacks are still warm cut them into 18 squares but leave them in the tin to cool completely. If you try to take them out of the tin while they are warm they will fall apart.